With the holidays fast approaching, I am finding myself more and more pressed for time. My husband is a huge fan of breakfast for dinner, but I have a tendency to want to avoid the time spent cooking and cleaning up from frying the breakfast meats. Well, I have found the solution to this problem. Brown ‘N Serve Fully Cooked Sausage Links are packed with protein and take the work out of breakfast, I mean dinner! In today’s hectic world; these delicious Sausage Links are ready to serve in as little as 45 seconds out of the microwave or 9 minutes in the skillet; are the perfect addition to any weekday meal. While you at shopping at Walmart for your Brown N Serve Sausage Links, don’t forget to get your Ibotta $1.00 rebate! You can find Brown ‘N Serve links in the packaged meat section of Walmart. Once you have gathered all of your ingredients you are ready to begin preparing your pizzas! Preheat your oven to 350 degrees. Wipe, rinse and trim the stems from your mushroom caps. Put 1-2 tablespoons of Hunts Pasta sauce on each mushroom cap. Some larger caps will need two tablespoons, and smaller ones may only take 1. Cut the cooked sausage links into several small pieces to place on the mushroom cap. Tip: You won’t need much seasoning, the Brown ‘N Serve Sausage Links packs a big punch of robust flavor. Sprinkle the shredded cheese over the pizza. 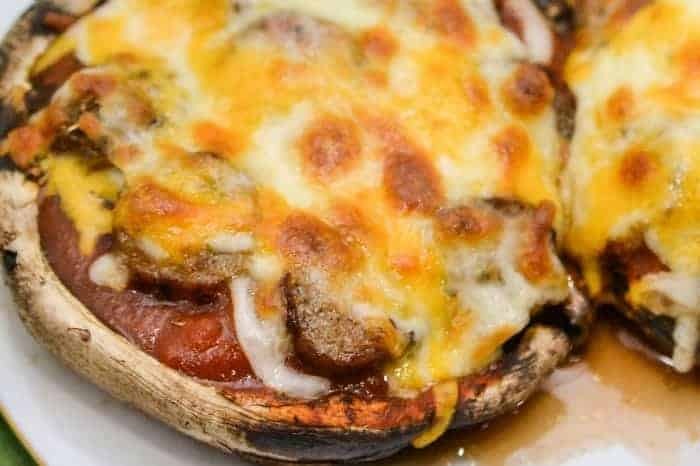 Bake your portobello mushroom pizzas for about 8 minutes at 350 degrees. After the 8 minutes, turn your broiler on for about 3 minutes. This way your cheese will get melted and browned to perfection! Prepare your Brown 'N Serve Sausage Links according to the package directions. Put 1-2 tablespoons of Hunts Pasta sauce on each mushroom cap Some larger caps will need two tablespoons, and smaller ones may only take 1. With little mess and no fuss, you have just created a delicious, mouth-watering masterpiece that makes a delicious meal or delectable holiday appetizer. Something this good and quick to make could have many uses! I am a huge fan of breakfast pizza but haven’t had any for quite some time now. I think if we used Egg Beaters and Ro*tel with the Brown ‘N Serve Sausage and cheese on the mushroom, would we have the perfect breakfast (lunch, or dinner) pizza? What ideas do you have for a quick anytime meal? Is there a way to get away from the "water" the Portobello's leave behind in the plate? Thx!! Hey CJ! Try using a paper towel like you would with bacon before plating them. Mushrooms are about 90% water so you will probably have some water no matter what you try but this should help some! Thx Shasta...I will do that as these look yum! Appreciate your tip.